Padlock security seals provide identification and tamper-evidence for many smaller applications, including key cabinets, airline trolleys, first aid kits and more. Their small and light-weight design, coupled for easy and quick application, makes them ideal for confined spaces such as cabinets and trolleys. 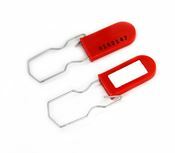 Padlock seals seals range from very strong metal hasp designs which require a cutting tool to reomve, to easy-break Uniflex D padlock seals which can be easily removed from emergency kits/ medical cases for quick access. 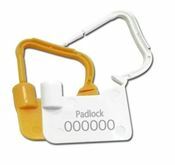 Our Unipad S padlock seal is particularly suited as a key tag for use with key cabinets, which control access to keys in many industries, including car dealerships, construction sites, and property agencies. A key and a retention peg can be threaded through the metal hasp of the padlock seal, and securely sealed. This allows for secure key tracking - each key's retention peg is placed in a key cabinet, and can only be removed with a user's own identification peg.